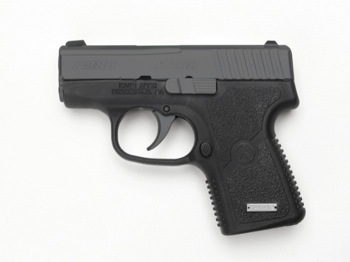 The Kahr P380, is now available in a Black-Out version for a sleek, subtle concealed carry option. The new KP3834 has a black polymer frame, just like its P380 match, but features a matte blackened stainless slide for a completely different look. The slide is blackened using an ultra hard and super thin coating that has been used successfully in the knife industry to protect blades from corrosion and scratches. So, not only does the blackened slide offer a new unique and attractive profile, but it also provides a tougher coat and protection for your slide. This helps you keep your Kahr looking just as good as the day you bought it, even after some wear and tear. The all black KP3834 maintains the same measurements as the original P380. It has an overall length of 4.9” and a height of 3.9.” It features a 2.5” premium Lothar Walther match grade barrel. The weight of the new all black 380 is 9.97 oz without the magazine. 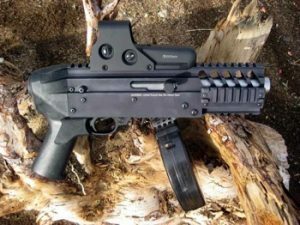 The magazine capacity is 6+1 in a single stack configuration. The KP3834 also has drift adjustable, white bar-dot combat sights with optional tritium night sights available. The all black KP3834 has an MSRP of $690. The KP3834N, with tritium night sights, has an MSRP of $799. Learn more about Kahr Arms and check out all the P380 options, along with the entire line of Kahr handguns, by visiting Kahr.com.